Bowed walls are often caused by too much lateral pressure from the soil outside, but also can be a result of poor drainage, uncontrolled water, soil shrinkage, and a frost push. Before repairing cracked, bowed, or buckled walls its important to have the problem professionally assessed so a permanent solution can be found. Over time, many basement walls begin to fail and bow, becoming more and more prevalent as time passes. 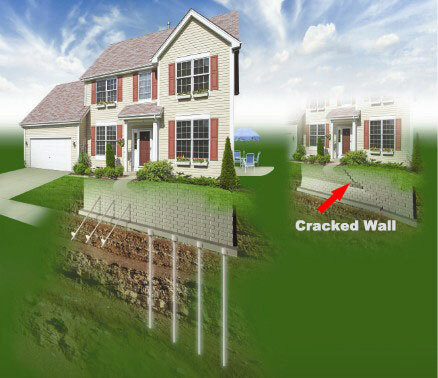 If the foundation of your home or business has this problem, or if the foundation is sinking, it must be repaired quickly because it most certainly will get worse.